Well, as the saying goes— “This is another fine mess you got us into!” Obama drew a red line, daring Assad to go over it, sounding like the narcissistic bully that he is, and the world has called him on it. But, he didn’t really mean it you see, because he uses threats all the time. It’s how he got where he is: The art of the Jesse Jackson shakedown, might work in America, but, it doesn’t play too well in the world, because other world dictators are much better at that game. 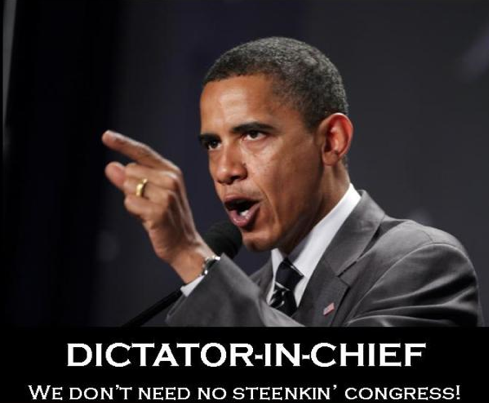 And Obama has got the dictator bug. He now calls the military “MY’ military. The American hating Muslims, unlike your usual politically correct white liberal here in America, are not impressed, with a man blowing smoke and awe, and then going to play a round of golf. Who can take him seriously? 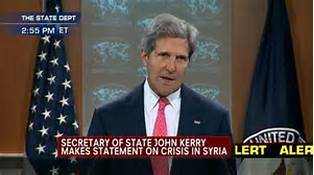 Kerry kept saying to anyone who would listen today—how ‘courageous” Obama was. Yes, Kerry was impressed. It takes courage to face Congress. Especially when they are out of town, and you are on the golf course. 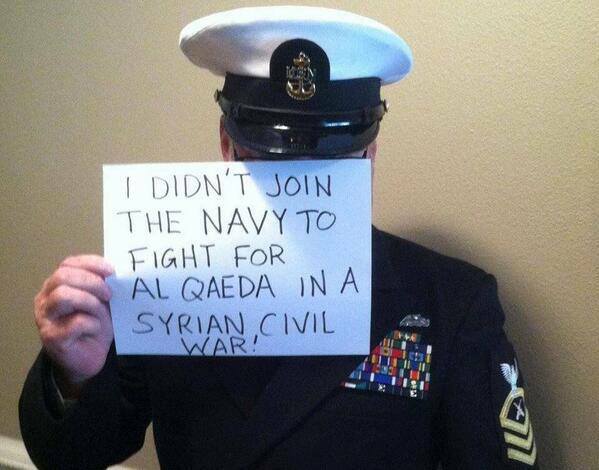 According to all polls, 80 percent of the American people are against getting involved in Syria. So—they will ‘sell’ us on it, like they are ‘selling’ us on Obamacare! A vast blitz of propaganda will be coming in the next week. Nancy Pelosi will go from the poor children who are dying from not receiving health care in California, to the poor kids being gassed in Damascus. Get ready to see over and over again the same old pictures of people foaming at the mouth. But–Nobody Wonders: What good is Congress if Obama can still do what the heck he wants? I don’t know how many times I heard that on TV today. Obama has the right, if he sees fit, to attack any country at any time, and we’d better not forget it! It’s a matter of ‘national security” which means that Assad can gas…Chicago I guess. Frankly, I wish they’d be more specific. “The Chairman [of the Joint Chiefs] has indicated to me that our capacity to execute this mission is not time-sensitive; it will be effective tomorrow, or next week, or one month from now. And I’m prepared to give that order,” Obama said, suggesting the one week delay or more until Congress meets will make no difference. And that’s all you need to know about Obama. HE has a red line, and it’s ‘time sensitive’. And HE can kill us all whenever he feels like it. HE is prepared to…destroy whatever is in his path to his own happy life, and we’d better all let him get back to it, and do what he demands. Nobody Thinks Obama has been giving America one red line after another since he has been in office. Somebody needs to take that red line of his and shove it back down where it belongs…back into the Constitution. Or else we should demand our own line..an impeachment line of no return. Hmmm? Are all of Obama’s actions just another way of saying na-na na-na boo-boo to Assad?